This bold and chunky piece makes quite a statement and will make a simple outfit look fabulous! It is 19 inches long with a center jeweled piece that adds another 3 inches. It begins with a thick, textured metal chain in silver with lovely, shear mint green ribbon running through it. Hanging from that are dark teal bicone crystals, small mint pearl rounds, black onyx saucers and large, barrel-shaped hematite beads. 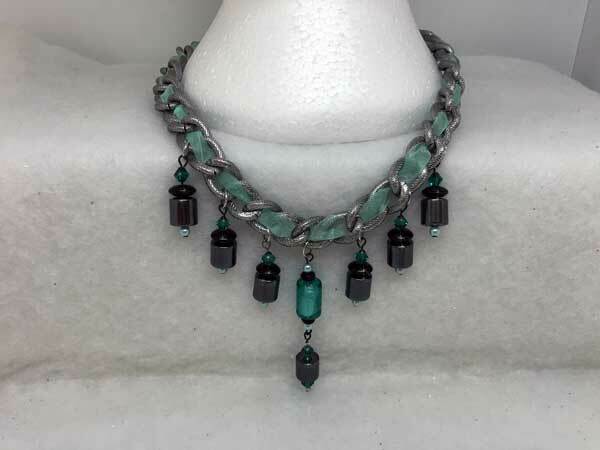 Pulling it all together in the center is a beautiful glass foil barrel bead in light teal, surrounded by fully-faceted black glass rondelles and mint pearl rounds. It connects with a large toggle clasp in silver.